I've long wanted to write about Justina Cassavell. My sister has been the cross-country coach at Voorhees High School in New Jersey since the mid 1990s. She is also the head track coach (boys and girls). She announced her resignation yesterday - within minutes it seemed, the story was posted on NJ.com. Under her leadership, the girls cross-country team has been one of the best teams in not just the state, but in the northeast. One local paper summed up her accomplishments: "Cassavell is recognized as one of the top coaches of distance runners, male or female, in New Jersey state history." She was inducted into the NJSIAA Athletic Coaches Hall of Fame. Her team has won [thirteen] state sectional titles, nine state titles, and three Meet of Champions (all group) titles (thanks to my brother-in-law for keeping the stats!). In recent years, they've also qualified for national competitions three times (placing first or second in the northeast in 2007, 2010 and 2012). In addition, she's coached individual runners on her teams to national ranking and helped them establish a foundation for their development as college athletes. My sister is known for helping runners realize their talent (e.g. gifted athletes like Liz Wort who graduated from Duke in 2007, was a 3-time all-American in the steeplechase and is now head cross-country coach at TCU, and Melanie Thompson, a University of Oregon runner and 2-time All American, also in the steeplechase). But my sister is also known for cultivating the good runner, the life-long runner. Running, I've heard her say again and again, should make you happy. I've also heard her say that she thinks of herself as a coach who really enjoys coaching a team. That's a special thing: because that coach takes an interest in the All-American but also in the struggling athlete, the injured, and the ordinary hard-worker. She knows that a good runner can be any and all of these things. Journalists covering high-school sports in the area tend to describe her as a "whisperer" - signaling the degree to which such attentive coaching seems like magic in a world that sells us pretty much one vision of what an effective coach looks like (a man) and does (yells, a lot) in the service of a single aim (win at all cost). Those are strong words describing the experiences of a great many parents and kids. Where some aspects of youth sports has been taken over by selfishness, greed, and cruelty, I've had the distinct pleasure of seeing the other side: The world being cultivated by the women who entered sports in the 1980s with a little help from federal legislation (my sister's scholarships were no doubt created by Title IX equity requirements). Those women ran in college and now they coach other young women at high schools, colleges, summer camps. Athletics is a way of life for them. And it's a sustainable way of life. That way of being in sports nurtures competitiveness, because that kind of competition is good for everyone. One person inspires another. A collective feels wonder at what one person among them can do. There is something both humbling and empowering about running alongside someone who is much faster, stronger than you. Over the past fifteen+ years, I've loved going to watch the Voorhees girls run. There's something so perfect about a cross-country meet. About being outdoors, about running along the course to cheer. About watching teams try. I love seeing how teams gather together at the end of the race - how the older athletes look after the younger ones. How kids look after teammates with different needs, how they lift each other's spirits. It's so damned nice to be reminded of what youth sports can be. As a person coaching teenagers, my sister quite literally coaches her athletes from childhood to adulthood. The high school coach has an incredible responsibility. I think she's really joyed in watching the people on her team mature, take responsibility for themselves and each other. If she likes to coach a team, perhaps that's why - part of being an adult involves learning to understand oneself in relation to, among others. Cross country is just a cool sport when it comes to that balance of the self with others. Nobody can run for you; everybody needs you to run your best. While my sister is eloquent on the thing that makes for a great competitor (the insane drive that will make a runner not just want but need to win the race) she has dedicated years of her life to helping young women find balance, to run their best, together. When I go home, I run with my sisters (both of whom ran track at Rutgers, my other sister worked with autistic children for years, and is an equally gifted teacher). Justina has taught me to keep myself relaxed, to take hills slowly, to let myself take my time so I can run long (after one session in which she talked about pace, I nearly doubled the amount of time I was able to run). I learned to listen to my body. I learned to notice when I was holding myself back. Running with Justina has helped my writing. It's helped me to take notice when I begin to move away from trying. When I think I can't do something, I put on my shoes and run. It seems like an escape, but it's really a kind of meditation. A practice, a way to tune in. The things you learn from having a holistic approach to a sport carry over into other areas of your life. We hear that all the time. But there's something to it: you don't just work out a problem through the mind or the body. You can work something out in one domain and bring the wisdom you found there to the other. Sometimes you need to do both at once, to trust yourself and give it a shot. She's the person that taught me this. I wish that when I was in high school I'd had access to coach like her. It's hard to imagine what a difference having a person like this can mean to a teenage girl - having access to a role model in the form of a grown-up woman, a person guiding you in developing a healthy relationship to your body, and doing so in a way that isn't about being pretty or cute or skinny or perfect but is about being strong, healthy and balanced. Anyway, all this is just to say I'm fiercely proud of my sister and all that she's accomplished as a coach at Voorhees High School. The (not-homophobic side of the) sports world has invested a lot of magic in the currently-professional-and-playing-out-gay-male-athlete. It's no wonder, given how elusive that athlete has been. Jason Collins comes out decades after Stonewall, he comes out long after Ellen DeGeneres came out while professionally-active-and-on-television and then recovered that career with her talk show, months after Frank Ocean came out about his love for a man. Johnny Weir was never not out. Orlando Cruz - a boxer - came out in October. Transgender athlete Renée Richards entered women's professional tennis in 1977: she had to sue for the right to do so. Hers is a landmark case. NBA, NFL and baseball players have come out before, but in retirement. In 2009, Gareth Thomas, one of the most famous rugby players in the world (captain of the Welsh team) came out while he was still in the game - he told first his coach and then his team. They embraced him. Thomas has been eloquent in his description of what being closeted as such a public figure means. In a recent interview for BBC, Thomas explained, "when you lie every day, you begin to hate yourself." It made him suicidal. Lists of athletes who have come out while they were playing date back quite a bit - take Billie Jean King, for example. Her 1981 outing was painful, not her choice and a powerful, frightening example - the story became a headline, a scandal and "in 24 hours" she lost all her endorsements. She went on to be an inspirational figure, a leader in the fight for a better game. The list goes on in all sorts of directions. Even given the diversity of public figures who have come out over the years, Jason Collins is the first pro in one of the sports that anchors mass sports media in the US to come out while still on the roster. As an active player, his livelihood is dependent on a patriarchal, racist and homophobic machine. It is no surprise that it has taken so long for a man in this particular sports environment to identify himself as a member of that class of people mainstream sports culture defines itself against. Coming out is huge. People have been chiming in with a list of other names. People want to remember the women who've been there before. In addition to those mentioned above: Martina Navratilova (who, like King, came out in 1981), Amelie Mauresmo, Sheryl Swoopes, Chamique Holdsclaw, Missy Giove, Natasha Kai, Megan Rapinoe, Vicky Gallindo, Liz Carmouche. There are a lot more gay women in sports, but the media doesn't quite know how to address them - or their fans. 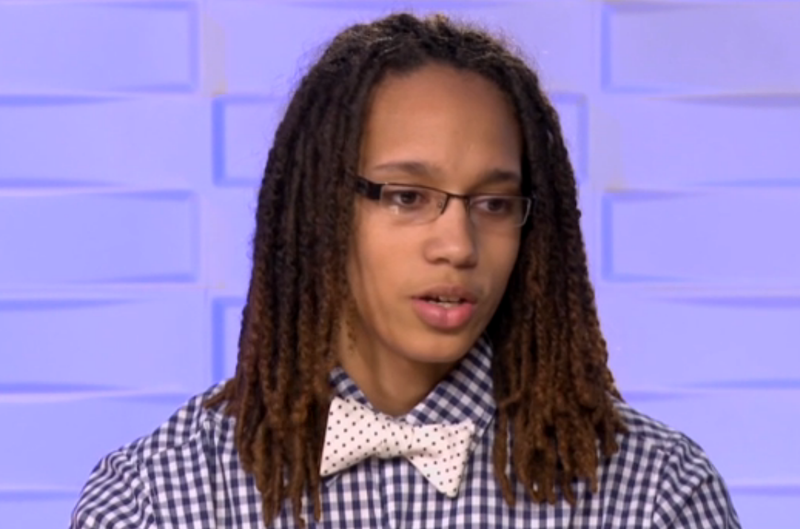 We can see this in how Brittney Griner's "coming out" is presented as a story about how her coming out is not a story. Female professional athletes are already gender non-conforming. Male ones are still worshipped as exemplars of traditional masculinity. Extremely sporty women have to fight stereotyping that they are lesbians and ignore all manner of unkind commentary about how they are mannish, while sporty men are seen as participating in a form of the masculine ideal. This is given as the context for understanding why Brittney Griner's coming out isn't news. The rhetorical frame here accepts the "either-or," gender segregated structure of mainstream sports culture. It reinforces common sense about what matters, and how. Collins's coming out means more than Griner's. To whom? My mind was properly blown by Griner's so-called coming out. Not because I thought Griner was straight. But because in that interview (for SI.com, because such interviews with women aren't conducted on, say, television) Griner was so damned smooth (her outfit!). It wasn't a "coming out" so much as an "always already been out." (This is also the style of Rapinoe's coming out). SI Video host Maggie Gray: "Another big topic in sports recently is sexuality, especially with the NFL. In football it was rumored that maybe one or more players were going to come out--that would become huge news in the sports world and in general. In female sports, women's sports, in the WNBA, players have already come out, and it's really accepted. Why is there a difference between men and women in that issue?" It's a nice conversation. Gray opens the door and Griner walks right through it as if it were the most natural thing in the world. Because in her world, it is. But Gray opens this interview with a telling observation - an observation that allows us to see why Griner's coming out isn't a story: "It's not often we get to talk to three world class athletes that are also women." It isn't often, in other words, that we get to have this conversation (with women, between women) at all. Lost in the story about it being "easier" for lesbians in women's sports is the larger apparatus that aggressively marginalizes women athletes. There's a relationship between the relegation of Griner's statement to a web-only platform and the making of Jason Collins's coming out narrative into a Sports Illustrated cover story. Griner's is a women's sports story - and women don't merit headlines, they aren't the lead story, they just don't mean as much - they aren't worth as much. Minimized in language about how women athletes are always already gender non-conforming are the stories of butch women athletes who have been kicked off teams, harassed, assaulted - killed, even. Being an out gender non-conforming woman athlete is hard, and in some contexts it is dangerous. And that isn't much of a "story" either. Mainstream sports culture devotes an enormous amount of energy to keeping things that way. Its commitment to maintaining the delusion that there are no gay men playing in the NBA is a part of the same problematic system that minimizes the whole of women's sports as less interesting, less valuable, less meaningful. The ecstatic language that greets Collins as the magical figure that will transform sports culture has a weird shadow. Ecstatic: Finally, a man! Weird shadow: Because women can't have that magical effect on a patriarchal space from which they are banned. Collins's coming out won't make the NBA into a queer space. But it does makes a little more room in the mainstream for gay and lesbian athletes. And that's no small thing. But it's perhaps not quite as exciting - or as revolutionary - as what's happening in women's sports. Which isn't so mainstream. Which is why it is, and isn't news.